If you want to live in a quiet, yet central area, you are in the right place. The accommodation is peacefully quiet in the countryside and is fully equipped. 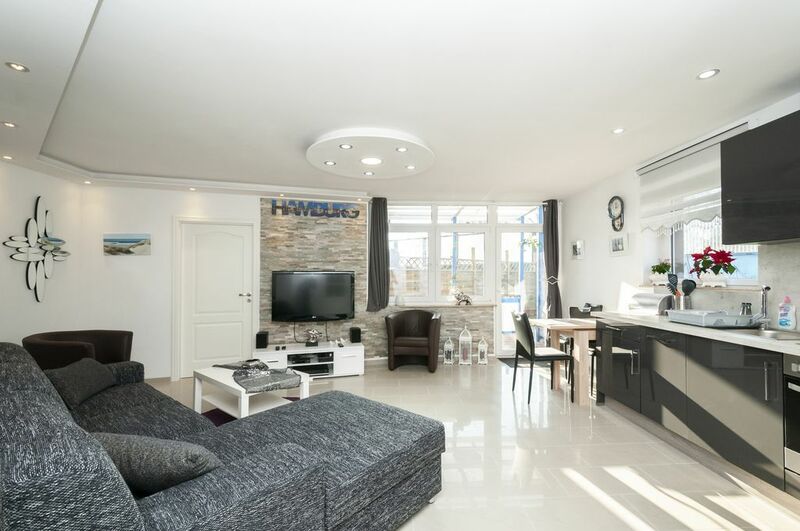 It is newly renovated and has a modern bathroom with shower and toilet, underfloor heating in the entire apartment as well as tiles and curtains. The accommodation (46 m²) is a separate apartment with separate entrance and sunny terrace. It has two bright rooms with open kitchen. For your walks, there is a beautiful park with lakes nearby. In addition, there are good shopping opportunities in the immediate vicinity. The apartment is divided into a large living room with open kitchen and a bedroom. The living area has a sofa bed and a 42 inch flat screen TV with satellite connection. The kitchen is equipped with an electric stove with oven, a dishwasher and a microwave. The bedroom has a double bed (180x200) and a wardrobe. Modernized bathroom with window, shower with rain shower head. In the storage room is a washer dryer. A few meters in front of the apartment there is a bus stop or 900m away is the nearest underground station. The apartment is located in a relaxing green area, but still close to Hamburg city center. For walks, there is a beautiful lake park nearby. Good shopping can be found in the immediate vicinity in the Kandinskyallee.